Nokia is running yet another great promotion for any Nokia Lumia Windows Phone purchase, this time purchases through the month of June will qualify. 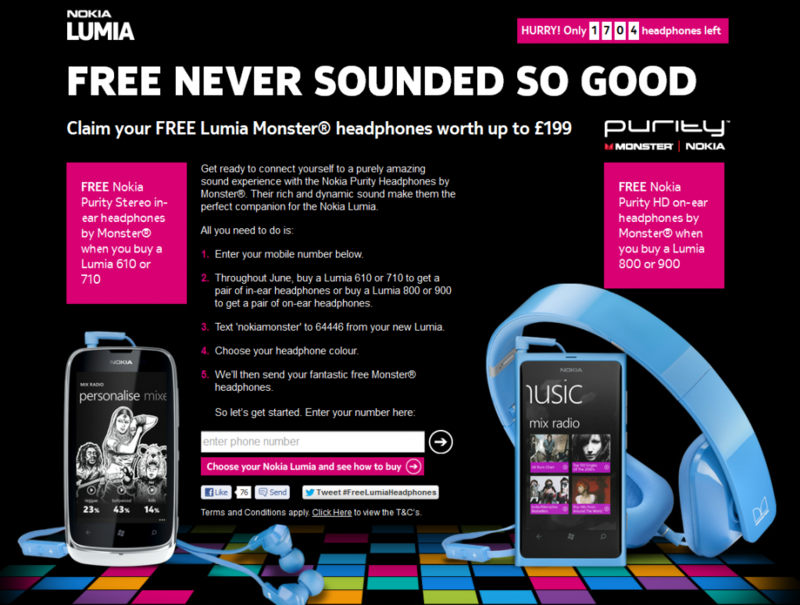 The rules are simple: If you purchase a Lumia 610 or Lumia 710 you receive a free set of Monster Purity Stereo in-ear headphones; purchase the Lumia 800 or Lumia 900 and you receive a set of Monster Purity HD on-ear headphones. This promotion only applies to residents of the United Kingdom, you must be at least 18 years old. You must purchase any of the Lumia Windows Phones at an authorized retailer in the UK between June 1st and June 30th, 2012 to be eligible. Buy a Nokia Lumia in June* and you can rock out with a free pair of Monster® headphones worth up to £199. At the time of this post, there are only 1704 headphones left, as the http://www.nokiamonsteroffer.co.uk/ page indicates. Get out there and get your new Lumia Windows Phone before those headphones run out! For reference, here are some useful links: Nokia UK ad page for promotion, Nokia Monster promotion redemption page, and terms and conditions.